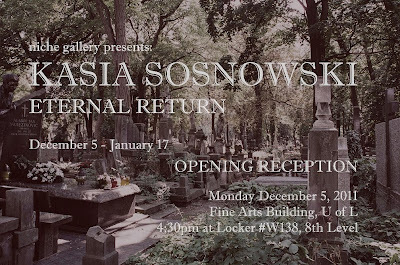 Kasia Sosnowski's exhibition, Eternal Return, will be opening this Monday December 5th at 4:30pm in front of the gallery. 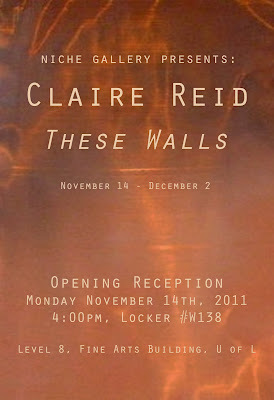 Feel free to stop by for a visit, have a snack, and speak with the artist. Juice, cheese, crackers, grapes - the usual - will be there! (oh yeah, and cookies, too). Join us for some great conversation with your fellow colleagues! 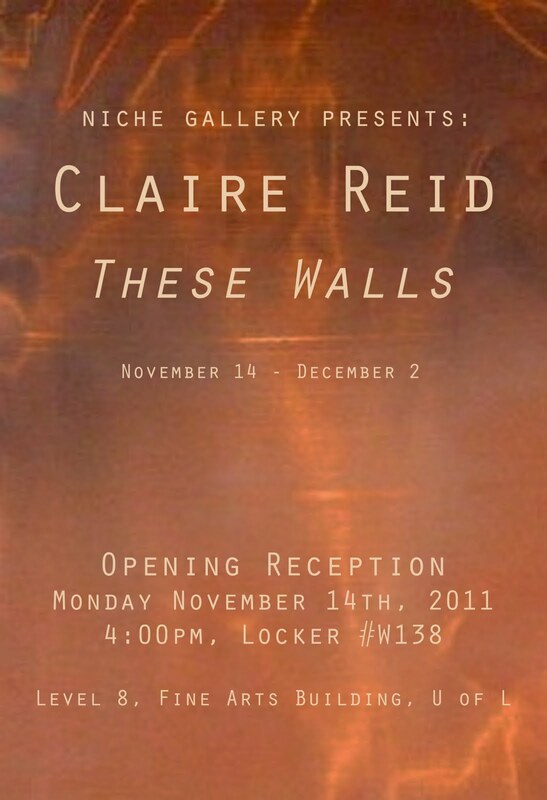 Claire Reid's exhibition, These Walls, will be opening this Monday November 14th at 4:00pm in front of the gallery. Please come by and see what it's all about, and have a snack while you're at it! The artist will be present to answer any questions you may have. 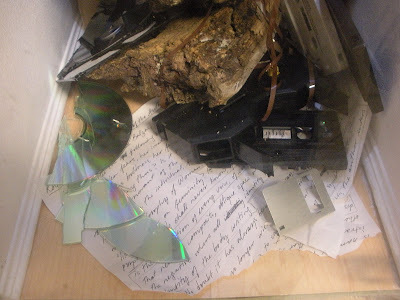 "Do you ever wonder what will happen to what we currently seem to see as breakthrough technology? Whether it will become obsolete in a matter of time, and if so, what does the constant introduction of newer and better technology mean for the evolution of humanity? an/a/10g/y, currently being exhibited at the Niche Gallery, is a clever exploration of language and technology, created by fifth year B.F.A art studio major Bonnie Patton." 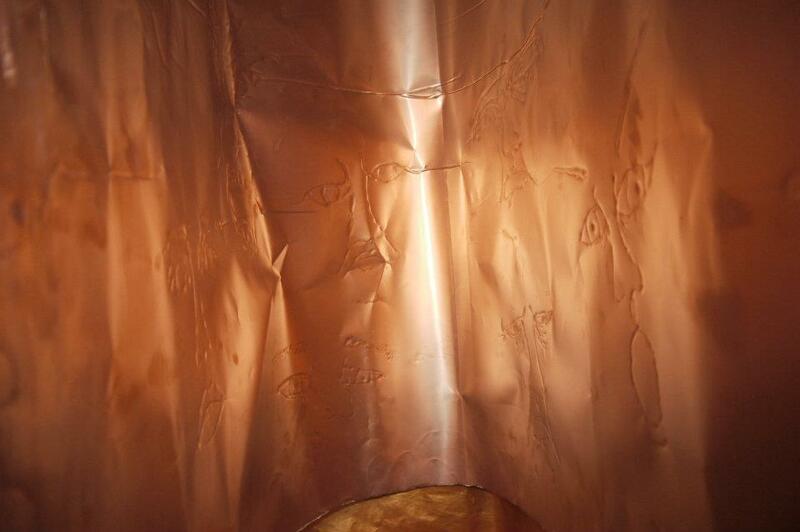 This site documents all of the current exhibitions taking place at the niche gallery. If you are interested in showing in our gallery, please join our Facebook group page for further communication. 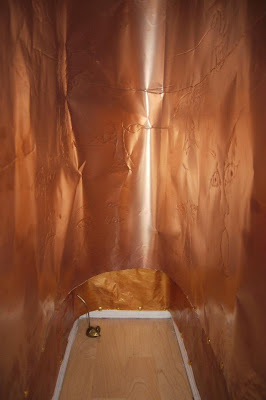 "Often, galleries act as containers, a space used to create separation and exclusion from the outside world. You have to walk into this foreign space in order to engage with the artwork and not everyone can show their artwork there. The niche gallery is questioning the ideals that many institutions adhere to, such as hierarchy, control, and exclusion." - naomi sato, from her manifesto titled "White-Cube, Plexi-Glass Door". As of April 2011, the niche gallery is a member of a new movement that has started in Vienna, Austria called the Locker Gallery Association. If you'd like to register for your own locker gallery license, or just out of sheer curiousity, you can visit their website at www.lockergallery.org. The logo below is also a link to their website. "The niche gallery is set within the institution yet works outside the institution"
"The niche gallery is a place for anyone to show their work, whether it is a student, faculty member, or someone outside of the institution. 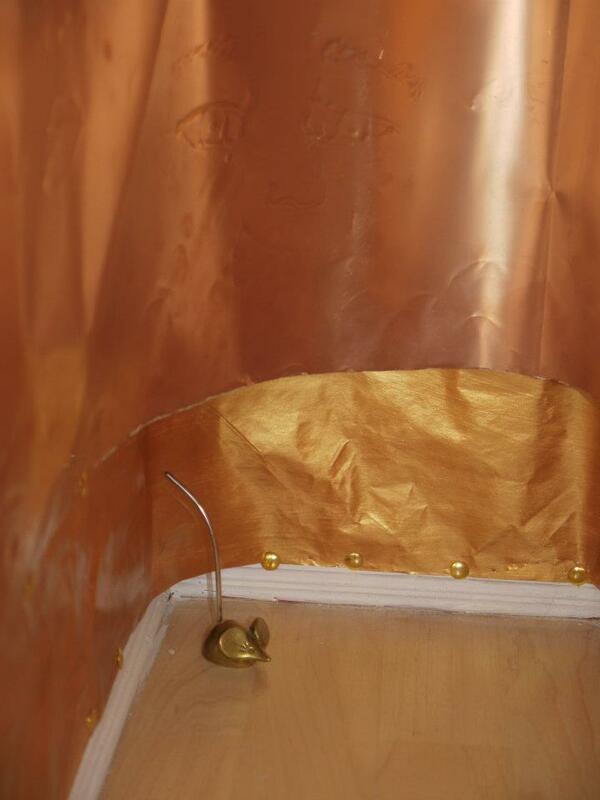 The plexi-glass door also allows the viewer into the space as well, a space that is normally private. With niche gallery, the text panels are placed outside of the interior space because the gallery itself is art. When the niche gallery is between exhibitions, the space is still open. Although the space is empty, it is full. When another artist places his/her work in the space, it creates collaboration between the space and the artwork, between the artists and the viewers. Each piece has its place and remains separate, but also works together. There is a difference between inside and outside, but they co-exist"
Join our niche gallery group on facebook to post comments and generate discussions about the gallery. Suggestions and feedback are welcome and encouraged. The gallery team would like to extend a special thanks to Professor Michael Campbell and U of L Art Gallery Administrator Fred Greene for their continuous support of the niche gallery project. As well we'd like to thank Professor David Miller for suggesting that we document the exhibitions on a website. Also, thank you to the 2008-2009 U of L Art Society Executive for their decision to include the niche gallery in the group's agenda. We also appreciate the collective interest and support of the U of L Art Department for encouraging students to continue to develop the existence of the niche gallery. As the niche gallery is not-for-profit and has very limited funding from the Students' Union, if you would like to make a donation to the gallery, please contact us. We'd also like to thank the technicians Catherine Ross, Kevin Sehn and Chai Duncan for their technical knowledge and expertise. They're always willing to help us when we have questions about how to renovate, fix, clean, or install in the niche gallery. Without the technical and physical work, the niche gallery wouldn't be maintained! niche gallery now has access to club rights and privledges through the ULSU (University of Lethbridge Students' Union) as part of the U of L Art Society. This means that we can now host events in the Atrium and other sites on campus. However, the niche gallery is funded separately from the Art Society. Check for our regular exhibition posters, now being featured in the ads of the University of Lethbridge student-run newspaper, The Meliorist. *This seems to be an on-and-off occurrence. We would like to have this be a consistent thing in the university paper.